Here, I’ll walk you through a simple but useful way in which a tool called Data Miner can be used when approaching content creation. Hopefully this fairly straightforward post will give you some ideas as to how you could incorporate the tool into your own ideation process. For those of you not familiar with it, Data Miner is a tool which allows you to scrape data from web pages and transfer it into spreadsheets. The tool looks for patterns in what it sees on page, meaning that if you find one element – such as a page title in Google search results – it will list others. Once the tool’s collected elements, it’s easy to transfer the data it’s found to an Excel sheet, from which it can be useful to look for patterns and trends. 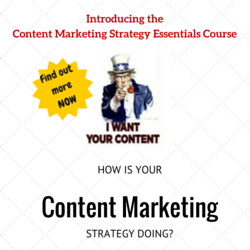 Why Use it in Content Marketing? A key aim of Content Marketing is to create something which is useful or interesting to our intended audience. Due to this, it’s very useful to find the places that they “hang out” and analyse what they’re talking about. This helps by giving us a better idea of what users’ key concerns, questions and interests are, and allows us to create content which is likely to engage them by responding to these. The role that the Data Miner tool plays in this process is in allowing us to compile user-generated pages which show up in search results into a manageable format (on a spreadsheet). When this data is analysed and sorted, then backed up with complimentary research, the insights found can be very useful in everything from content creation, to information architecture building and keyword generation. Once you’ve downloaded the tool here, it’s first a good idea to adjust your search preferences, so that you can view up to 100 results at once. Data Miner will only recognise what it sees on page, and it’s obviously easier to export data in chunks of 100 search results than the usual 10. You can change your search preferences by following this link. Next, you’ll need to find relevant user-generated content to mine. 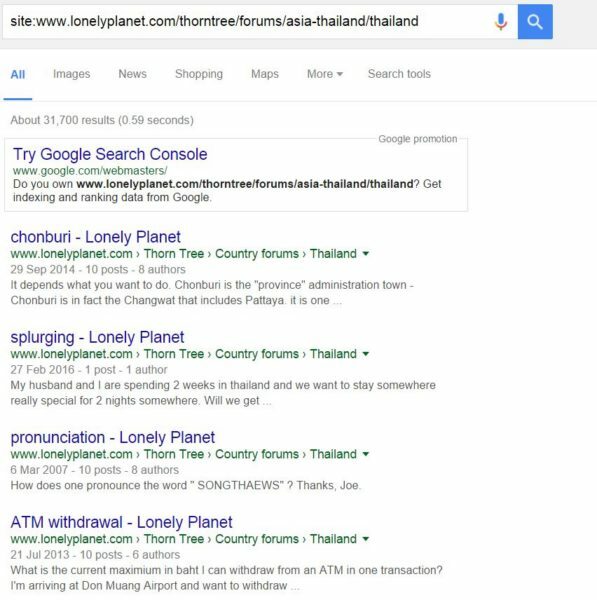 We’re looking for any sets of pages where we can see that users have a clear affinity with our client’s product or service, and really need to be returning at least a few hundred results on the SERP in order to carry out a comprehensive review. I often find that forums are very useful in this process, as they exist for a huge range of topics, and even if you sell something fairly niche, you’ll often find those which can be useful. Once you’ve found a promising forum or set of web pages, use advanced query operators to help you find a relevant, manageable list of results. After ascertaining the URL of a targeted group, performing a site: search is a good place to start. This will show you all of Google’s indexed pages from this URL. 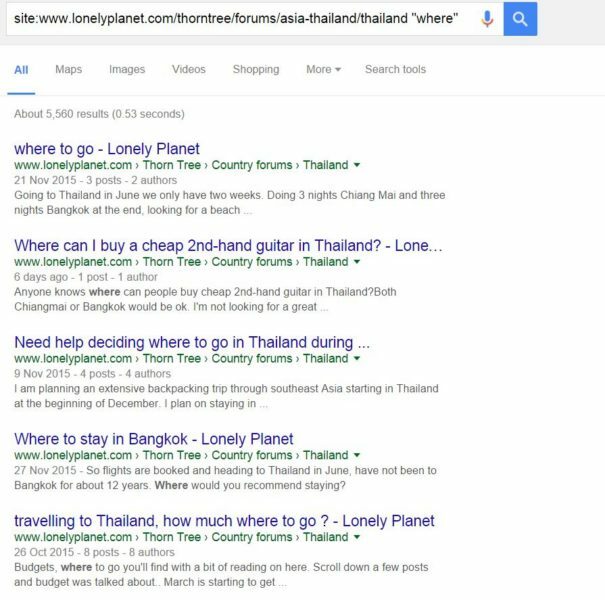 In the snip below, I’ve imagined that we’re creating content for a client specialising in holidays to Thailand, and we’ve chosen to use the forum in the search bar below to generate useful results. Next, it’s a good idea to refine the search further, in order to cut out as many irrelevant results as possible. Searching for words such as “where”, “how” and “why” can help you find users’ key questions, and searching for any specific keywords you already have in mind to target is also a good idea. Some particularly useful operators here are Inurl: and Intitle:, as well as the simple use of a minus or searching for full quotations. I won’t go through all of the operators you could use here, but it’s worth experimenting in this phase until you find a list of results which look fairly relevant. Once we have these results, it’s a matter of right clicking on the first result from the SERP, then selecting “Data Miner Get Similar”. This will open up the Data Miner extension, from which you can export your results as an Excel sheet. Carry out this process for a few (at least 10) pages in Google’s results for your selected query. Combine each spreadsheet you create onto just one, then take a look at the title tags you’ve been provided with. Now that you have this large sheet of results, the first thing to do is to use it as qualitative data. Each result you see is an individual’s question, so each is a little nugget of insight into the mind-set of those with a shared interest in the area or product which your client is trying to sell. When certain queries come up multiple times, this can be a good indication that there is a demand for content responding to them. There are various ways that Excel can make this process easier, but probably the easiest it by filtering the title tag column, then selecting “text that contains” to find all page titles mentioning whatever you’re interested in examining as a keyword idea. A couple of examples can be seen below, one with the text filter “weather” and another with “party”. At this point, you should have a few useful insights into the mindsets of people likely to be interested in your product or service, and have generated a few ideas for interesting topics to cover in your content strategy. Once you’ve created this list of possible topics, it’s worth cross-checking findings with other data sources, such as Google Trends and Google Keyword Planner. These will allow you to refine ideas still further, and to ensure that there is a strong enough interest in each topic to justify the creation of content around it. I hope that you’ve found this quick walk through one way to use Data Miner useful. If you have questions around any stage in the process, or would like to share how you use Data Miner yourself, please do let me know in the comments section below. Feature image – The Magic Tuba Pixie via Flickr. 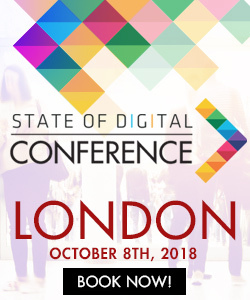 Jack Telford is a Digital Content Executive at Digital Marketing Agency theMediaFlow, where he specialises in the research, planning and creation of content marketing material. He blogs on topics related to SEO, creativity, digital content and social media.